In these series of articles, I will demonstrate step by step how to build a really simple Angular 6 web application, using Angular Material. This application will call a free API, called DOG API. All this API does is return links to images of different dogs. Our Angular 6 project will show those pictures in a list, similar to the way Instagram is showing posts in their app. It will also allow users to like/love a post. Please be aware that this is a really simple app, put together in under two hours, just for fun. Do your own research before copying and using any of this code. There are lots of more efficient way of doing some of the stuff presented in this tutorial. This project will be built using the new way of generating starter components, by generating the default navbar and dashboard. Follow the quick start step by step instructions from angular’s website to set up the new project. Once the Angular CLI has been installed you can run this command: ng new random-dogs to create the new project code base. Once the project has finished installing everything, open the terminal in the root directory of the project, in our case just do cd random-dogs or right click on the project folder and select ‘Open in Command Prompt’ or ‘Open in Terminal’. Open http://localhost:4200/ in the browser. Well done, you have successfully created the angular project. 1. 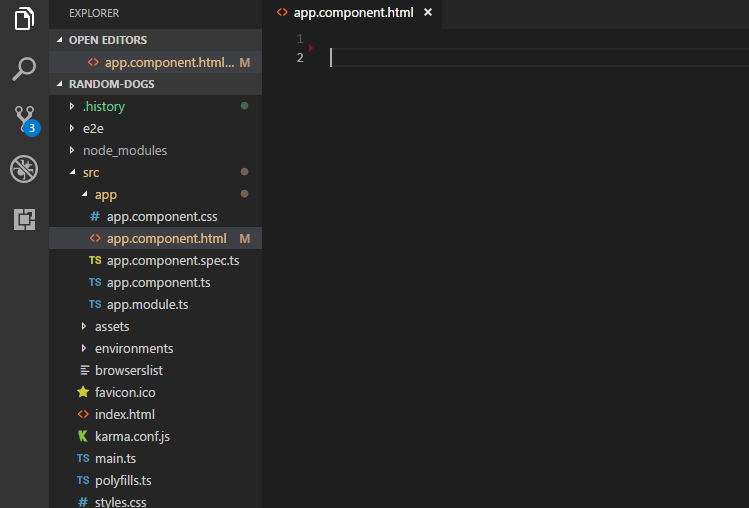 Delete contents of app.component.html file. Open the app.component.html file, located under /src/app/app.component.html. Select all the content of that file and delete it. Save the file afterward. If you check your RandomDogs website now, it will only display a blank page. NOTE: if you get a warning saying that you have a certain number of vulnerabilities, run the command npm audit fix and this will solve the problem. 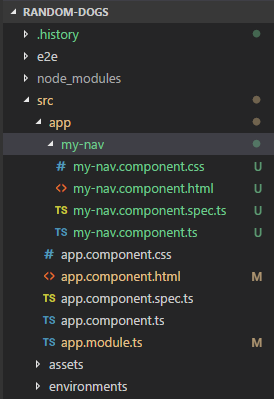 Once the angular material package has been added to the project, we can run the following command to generate the default navigation bar. This has now created a new folder located in /src/app/my-nav. 4. See navbar on the webpage. Open the style.css file from the root directory and add the following line at the top and save the file. 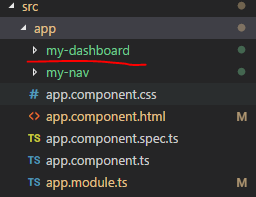 Open the terminal in /src/app and run the command below to create a default dashboard component. 2. Show dashboard on the webpage. Next, in part 2 we will set up the routes and customize the user interface.